Air Canada is Canada's largest airline. It flies from Canada to the United States, Europe, Asia, Australia, and some Caribbean countries. Air Canada began on September 1, 1937. 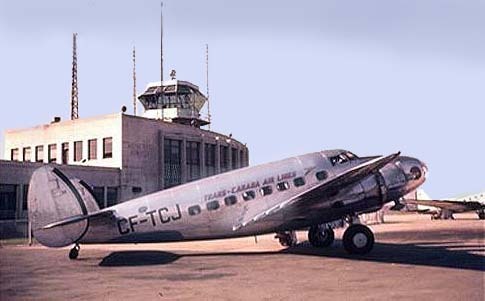 It was first called Trans-Canada Air Lines. The first flight was from Vancouver to Seattle. The airline's name changed to Air Canada in 1964. Air Canada was privatized in 1989. A large strike was launched by Air Canada pilots in September 1998. Air Canada bought Canadian Airlines in 2000. Since the early 2000s Air Canada has had many financial problems. Air Canada has ordered the Boeing 737 MAX airplanes for the future. It is still receiving more Embraers and Boeing 787s. In the past, Air Canada had Airbus A340s, Boeing 727s, Boeing 737s, Boeing 747s, Douglas DC-8s, Douglas DC-9s and Embraer 170s. An Airbus A321-211 displaying the new Air Canada livery. The Air Canada headquarters at Montréal–Pierre Elliott Trudeau International Airport. Air Canada Facts for Kids. Kiddle Encyclopedia.